CARACAS (Sputnik) - A group of Russian military personnel have arrived in the Venezuelan capital of Caracas to take part in consultations with country's officials on defence industry cooperation, a diplomatic source in Caracas told Sputnik. "[The Russian military personnel] has arrived to take part in bilateral consultations," the source said when asked about the possible arrival of two aircraft with the Russian military. The source noted that there was "nothing mysterious" about that because the visit was directly related to contracts that had been signed by the two countries years ago. "Russia [and Venezuela] have a number of contracts, which are being implemented, including contracts on military and technical cooperation," the source added. The planes arrived in the Venezuelan capital on Saturday. Media earlier reported that an estimated 99 Russian military staff arrived in Caracas on board two planes, which also delivered 35 tonnes of cargo. Meanwhile, Venezuela has been suffering from a severe political crisis for around two months, after the leader of the country's opposition, Juan Guaido, illegally proclaimed himself interim president, contesting the re-election of Venezuelan President Nicolas Maduro last year. The self-proclaimed interim president immediately received support on the part of the United States, which has also denounced Maduro's re-election, along with a number of other countries. 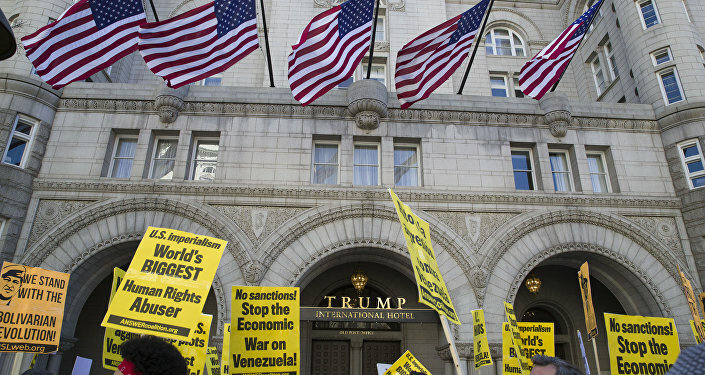 Both Caracas and Moscow have been expressing concerns that Washington may resort to military means to oust Maduro from power. China, Cuba, Russia and a number of other countries have endorsed Maduro as Venezuela's only legitimate president.